Meet 8-year-old Featured Maker Charlotte! She has many hobbies, such as swimming and chess. She also loves to write and, of course, code! In school Charlotte loves writing and math. Her dream career? To be an architect! When she makes a couch fort, she always plans in advanced how to use the cushions and arranges them accordingly in the space she uses. Charlotte was so nice to take some time and talk to us about why she loves coding! How did you get introduced to Tynker? When I was in 2nd grade, we had our own iPads, and there was an app installed called Tynker. I started playing it and I learned from other classmates and I wanted to install it on my iPad, so I did that! How did you learn how to use Tynker when you were first starting out? I used a couple courses, maybe not that many when I was in the classroom, but right now I usually use more courses when I’m actually playing on my iPad! How have your coding skills improved since you started using Tynker? There’s lots of different coding apps that I use, I have this thing that I have on my mom’s computer called Scratch! I like to play it a lot, and sometimes at school they put us on computers. 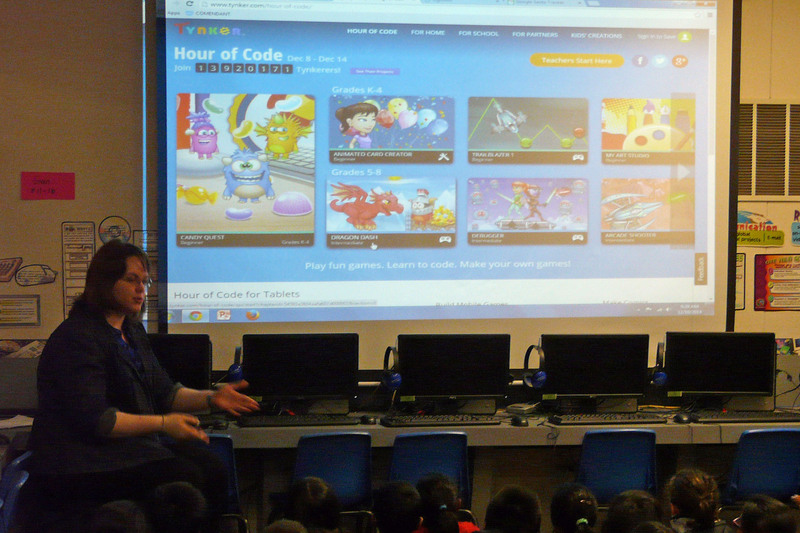 And everyday we have Tynker time and they allow us to do this coding thing where we get to code on Scratch! What is your favorite project you’ve made so far? What do you like about it? I really like them all! I don’t really have a favorite! How do you get inspiration for your projects? Usually, I don’t use Tynker when I don’t have an idea, but whenever I have an idea and I’m free, I just go on Tynker and make the idea happen. And sometimes I just go on because I want to remix a couple things. Why do you like to code? A lot of people in my class are doing it and I feel like it’s comfortable with me and just a fun way to work! What is your favorite way to use code? Sometimes I like to do animations or games. I think animations are easier for me because sometimes finding the blocks is a bit hard. What do you do with a project when you’re done with it? I look at it over and over, make a feeling about it, and then I just publish it and sometimes show it if I think it’s really good! What’s the best thing about Tynker? I think Tynker is great because you can see what other people are doing. How do you think learning to code has prepared you for the future? My dad always says you want to get good at lots of things and then choose the stuff you really like and then do it. And if you don’t really like something at least if you have to do it, you can do it, because if you try lots of things you can do them even if you’re not really into them. What advice would you give to kids starting out with Tynker? You should take a look around Tynker and try to make a project. You should look at all the code blocks, all the characters, and see how you make a background and everything! Thank you Charlotte and Kat for making this interview possible! We simply can’t wait to see what Charlotte will show the Tynker community next!